Judge Marilyn Moores, who presides over the juvenile court in Marion County, Ind., says the number of children who are in need of foster care because of the opioid epidemic has more than doubled in the past three years. The U.S. foster care system is overwhelmed, in part because America's opioid crisis is overwhelming. Thousands of children have had to be taken out of the care of parents or a parent who is addicted. Indiana is among the states that have seen the largest one-year increase in the number of children who need foster care. 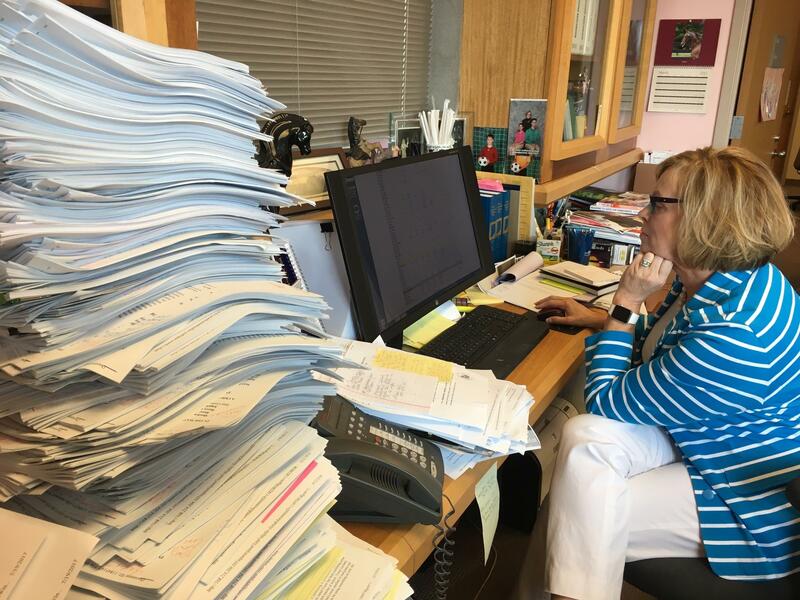 Judge Marilyn Moores, who heads the juvenile court in Marion County, which includes Indianapolis, says the health crisis is straining resources in Indiana. "We've gone from having 2,500 children in care, three years ago, to having 5,500 kids in care. It has just exploded our systems," Moores says. While laws in all U.S. states require that child welfare agencies make "reasonable efforts" to reunify parents with their children, Moores says that process can be especially traumatic for children whose parents often relapse. She says that more legal consideration should be paid to the child's rights and safety and that "right now, that balance does not tip legally in favor of the child." Earlier this year, President Trump declared the opioid epidemic a public health emergency. But that designation "didn't come with money," Moores says. "And that is sadly what the necessity is." She says reform is needed, and it should focus on "how much in the way of resources should be devoted to trying to reunify children with parents who cannot conquer their addiction." One of the hallmarks is we're seeing many younger children than we had seen before. I think the average age is about three years younger than we had seen. We see lots and lots of opioid-addicted babies following their releases from NICUs [neonatal intensive care units] where they went through withdrawal from opioid addiction that they suffered in utero. We see kids — little, itty-bitty kids — that are found in car seats in the backs of cars where parents have overdosed in the front seat. And because of the age of the children, we can't safely leave them with addicted parents. And so, it has just over-rolled our system. Well, we're scrambling. I've had kids that I've had to find a foster home for — not in Marion Country, but in Lake County, which is by Chicago. That's a two-and-a-half-hour drive. How can I reunify parents with a child where they can't even see their child on a regular basis? We have kids who are sleeping in the Department of Child Services office because there are no homes for them that can be quickly found. Our public defenders, our DCS case managers, our guardians ad litem, our judicial officers are all overwhelmed. But everyone pulls together to try their very best to ensure child safety. There's a lot of debate about that, but the law requires that reasonable effort be made to reunify first. Sadly, in some cases, the law has determined that parents have a due process right to their children. In other words, we treat children like chattel of their parents, like possessions, and these are Supreme Court precedent. I think that many of those precedents were issued at a time when keeping kids with parents, there were extended families who were able to help support and take care of kids, but we don't have that now. And I wonder if the law isn't antiquated in that regard. It's been incredibly difficult for funding to keep pace with the need and the demand for services. Our director of Department of Child Services just resigned and issued a letter saying that the constraints that the budget was placing on her all but ensured children would die. It didn't come with money. And that is sadly what the necessity is. That and, we need legal reform. We need reform that literally looks and says, "How much in the way of resources should be devoted to trying to reunify children with parents who cannot conquer their addiction?" The recidivist rate for opioid addiction is somewhere in the 70 percent. We can't keep parents sober long enough to reunify their children with them. And even those efforts come at great costs to the taxpayers, and they come at even greater costs for the children because being in this system is a trauma for children and these back-and-forth attempts in trying to reunify them with their parents is scarring these children. I think that we need to make reasonable efforts to try and reunify, but we have to have a better balancing of the child's right to safety, security, a right to pursue happiness, and honor that child's life as much as we're honoring the parents' right. And right now, that balance does not tip legally in favor of the child. Tim Peterson, Martha Wexler and Sarah Handel produced and edited this interview for broadcast. Emma Bowman adapted it for the Web. The U.S. foster care system is overwhelmed in part because America's opioid crisis is overwhelming. Thousands of children have had to be taken out of the care of parents or a parent who is an addict. One of the states with the biggest one-year increase in the number of children who need foster care is Indiana. Judge Marilyn Moores heads up the Indianapolis juvenile court and joins us now from member station WFYI. Your Honor, thanks very much for being with us. MARILYN MOORES: Thank you for having me. SIMON: You've called this a tsunami. What's happening, from where you see it? MOORES: Well, we've gone from having 2,500 children in care three years ago having 5,500 kids in care. It has just exploded our systems. SIMON: And help us understand it in as detailed a way as you can. What kind of cases are you seeing? What are you seeing in children and families? MOORES: Well, one of the hallmarks is we're seeing many younger children than we had seen before. I think the average age is about three years younger than we had seen. We see lots and lots of opiate-addicted babies following their releases from NICU's where they went through withdrawal from opiate addiction that they suffered in utero. We see kids, little, itty-bitty kids, that are found in car seats in the backs of the cars where parents have overdosed in the front seat, and because of the age of the children, we can't safely leave them with addicted parents. And so it has just overruled (ph) our system. SIMON: What do you do? MOORES: Well, we're scrambling. I have kids in - that I've had to find a foster home for not in Marion County but in Lake County, which is by Chicago. That's a two and a half hour drive. MOORES: How can I reunify parents with a child where they can't even see their child on a regular basis? We have kids who are sleeping in the Department of Child Services office because there are no homes for them that can be, you know, quickly found. Our public defenders, our DCS case managers, our guardians ad litem, our judicial officers, are all overwhelmed. But everyone pulls together to try their very best to ensure child safety. SIMON: Let me pursue a difficult and delicate matter. I think a lot of people listening to this interview will wonder, why put any priority on reunification of child and parent if that parent is an addict? Is that really a good idea? MOORES: There's a lot of debate about that, but the law requires that reasonable effort to be made to reunify first. Sadly, in some cases, the law has determined that parents have a due process right to their children. In other words, we treat children like chattel of their parents, like possessions and so they have - and these are Supreme Court precedent. I think that those - many of those precedents were issued at a time when keeping kids with parents - there were extended families who were able to help support and take care of kids. But we don't have that now. And I wonder if the law isn't antiquated in that regard. SIMON: I mean, obviously, it sounds like you need more resources, more foster families, more employees in the Department of Children and Family Services. You just don't wave a wand and have that happen, though, do you? MOORES: No, you don't. And it's been incredibly difficult for funding to keep pace with the need and the demand for services. Our director of Department of Child Services just resigned and issued a letter saying that the constraints that the budget was placing on her all but ensured children would die. SIMON: It's going to drive a nail in the heart of many people when they hear that. As you know, President Trump has declared the opioid epidemic a health emergency. Has that had any effect? MOORES: It didn't come with money (laughter). And that is sadly what the necessity is; that and we need legal reform. We need reform that literally looks and says how much in the way of resources should be devoted to trying to reunify children with parents who cannot conquer their addiction. The recidivist rate for opiate addiction is somewhere in the 70 percent. We can't keep parents sober long enough to reunify their children with them. And even those efforts come at great cost to the taxpayers, and they come at even greater cost for the children because being in this system is a trauma for children. And these back-and-forth attempts in trying to reunify them with their parents is scarring these children. SIMON: And how do you - how do you answer the cry of some of the parents who might be addicts that the only motivation they have to try and get clean is that they can one day become a good parent? MOORES: Well, I think that we need to make reasonable efforts to try and reunify, but we have to have a better balancing of the child's right to safety, security, a right to pursue happiness and honor that child's life as much as we're honoring the parent's right. And right now, that balance does not tip legally in favor of the child. SIMON: Juvenile court judge Marilyn Moores in Indianapolis, thank you so much. MOORES: Yes, sir. Transcript provided by NPR, Copyright NPR.